The Commish is an American comedy-drama television series that aired on ABC in the United States from 1991 to 1996. The series focuses on the work and home life of a suburban police commissioner in upstate New York. The series stars Michael Chiklis as Tony Scali, a former NYPD detective who is now the police commissioner in the small upstate New York town of Eastbridge, and tends to work through problems with humor and creativity more often than with violence or force. Theresa Saldana plays Rachel Scali, Tony's wife, and Kaj-Erik Eriksen plays their young son, David. Also living with the family in the first season was Rachel's freeloading brother, Arnie Metzger, played by David Paymer. A daughter, Sarah, played by twins Justine and Dayna Cornborough, was born to Tony and Rachel in the second season. The show focused as much on family situations as it did on police drama. The series deals with a wide range of topical social issues such as police corruption, racism, homophobia, drug addiction, disabilities, child abuse, illegal immigration, and sexual harassment. The series ran for five seasons. In addition to Commissioner Scali's family, the cast included police working for the town of Eastbridge. Commissioner Scali went through three lieutenants at his headquarters during the run; Lt. Irving Wallerstein (Alex Bruhanski), his longtime buddy and second-in-command, was killed in the line of duty after only a few episodes and was replaced by Lt. Paulie Pentangeli (John Cygan), his childhood best friend. At the start of the second season, Pentangeli shot an unarmed suspect who was reaching for a cigarette case. Although cleared of wrongdoing, Scali nonetheless fired him, suspecting that Pentangeli knowingly shot the suspect on whom they had insufficient evidence to prosecute. Pentageli was replaced by a female lieutenant, former FBI agent Cyd Madison (Melinda McGraw). She lasted two seasons until John Cygan returned to the series as Pentageli at the start of season four. Madison left the Eastbridge department to work as a commissioner in another city. Pentangeli returned despite his continuing disagreement with Scali regarding the nature of the shooting in season two. The star cops who also worked closely with the Commish included Stan Kelly (Geoffrey Nauffts), Carmela Pagan (Gina Belafonte), and hot-headed Ricky Caruso (Nicholas Lea). Series regular Kelly was killed off in season three, whereas other characters such as Pagan would simply disappear for longer stretches without explanation. Chiklis's character, Tony Scali, was at least ten years older than Chiklis' age at the time. At one point, the network worried that Chiklis's weight loss would have an effect on the ratings and reportedly asked him to stuff his clothing. He also was encouraged to not shave his head to look still older. Although set in the fictional town of Eastbridge in the Hudson Valley, New York, the show was filmed in and around Vancouver, British Columbia. The character, Tony Scali, was based on the real-life 30th Commissioner of New York City's Department of Correction, Anthony Schembri; Schembri also served as the Secretary of the Florida Department of Juvenile Justice under Governor Jeb Bush and as the Citrus County Florida County Administrator. Schembri was "discovered" after being a technical consultant for the TV series. Schembri was serving as the Police Commissioner of Rye, New York during that time. The show was unrealistic in that Tony would do many things a real-life police commissioner doesn't, such as chase criminals and investigate crimes. Although this series aired on ABC, it was originally slated to be on CBS, but unresolved casting differences with CBS led Stephen J. Cannell to cease pre-production with that network. Eventually, Cannell took the series to ABC and it won the ratings war with CBS for that time slot (Saturday nights at 10pm). The Commish also screened on KTN (Kenya Television Network) in Kenya, Nelonen in Finland, NRK in Norway, TV3 in Spain, RCTI in Indonesia, ProSieben in Germany, Sky One in the United Kingdom, RTÉ One in Ireland and the Nine Network in Australia. It is still broadcast on SBS Net in Denmark, TV4 Guld in Sweden and Canale 5 and La7 in Italy. It also airs in the U.S. on Heroes & Icons. Anchor Bay Entertainment released the first two seasons of The Commish on DVD in Region 1 in 2004–2005. Because of poor sales, no further seasons were released. These releases have been now discontinued and are out of print. In 2009, Mill Creek Entertainment acquired the rights to several Stephen J. Cannell series, including The Commish. They have subsequently re-released the first two seasons. On October 12, 2010, Mill Creek released The Commish: The Complete Series on DVD in Region 1. The 17-disc set features all 94 episodes of the series on DVD for the very first time. In Region 4, Beyond Home Entertainment has released the first four seasons on DVD in Australia. Theresa Saldana received a Golden Globe nomination for Best Performance by an Actress in a Supporting Role in 1994. ^ "The Commish DVD news: Press Release and Cover for 1st Season - TVShowsOnDVD.com". Archived from the original on 16 August 2016. Retrieved 8 June 2016. ^ "The Commish DVD news: Cover art for Feb.'s Season 2 Release - TVShowsOnDVD.com". Archived from the original on 16 August 2016. Retrieved 8 June 2016. ^ "Site News DVD news: Cannell and Mill Creek Ink New Distribution Deal - TVShowsOnDVD.com". Archived from the original on 14 February 2011. Retrieved 8 June 2016. ^ "The Commish DVD news: Early Box Art for The Commish - Season 1 - TVShowsOnDVD.com". Archived from the original on 16 August 2016. Retrieved 8 June 2016. ^ "The Commish DVD news: Announcement for The Commish - The Complete 2nd Season (Mill Creek) - TVShowsOnDVD.com". Archived from the original on 16 August 2016. Retrieved 8 June 2016. 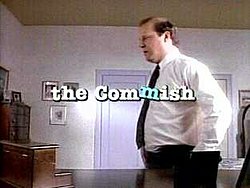 ^ "The Commish DVD news: Announcement for The Commish - The Complete Series - TVShowsOnDVD.com". Archived from the original on 11 April 2016. Retrieved 8 June 2016. ^ Commish, The – Complete 1st Season (6 Disc Set) @ EzyDVD. Ezydvd.com.au (2008-07-16). Retrieved on 2010-12-28. ^ Commish, The – Complete 2nd Season (6 Disc Set) @ EzyDVD. Ezydvd.com.au (2008-10-15). Retrieved on 2010-12-28. ^ Commish, The – Complete 3rd Season (6 Disc Set) @ EzyDVD Archived 2009-07-08 at the Wayback Machine. Ezydvd.com.au (2009-06-10). Retrieved on 2010-12-28. ^ Commish, The – Complete 4th Season (6 Disc Set) @ EzyDVD Archived 2009-10-08 at the Wayback Machine. Ezydvd.com.au (2009-10-07). Retrieved on 2010-12-28. This page was last edited on 17 April 2019, at 17:35 (UTC).